Professor Richard Marback will deliver a talk entitled “Unclenching the Fist: Making Sense of Embodying Rhetoric” as part of the 2006-2007 Humanities Center Brown Bag Colloquium Series. The talk is from 12:30 to 1:30 PM, Tuesday, December 5, in room 2339 of the Faculty Administration Building. Abstract: In February 2004, in response to the shooting deaths of two Detroit Police Officers, two men from Redford poured white paint over the Monument to Joe Louis. As their arraignment one of the men explained the vandalism by saying they had wanted to “unclench the fist.” The claim to want to unclench the fist may sound like a desparate attempt to justify an indefensible act. It may well be that. But is also an expression that raises questions about the rhetorical agency among people and objects. 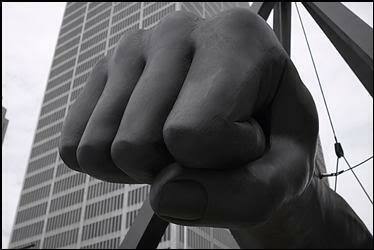 As iconoclastic gesture, vandalism of The Fist aimed to diminish the representational force of the monument. Instead the vandalism raised questions about whether the monument represents Black Power and where that representation resides. Does it reside in the Fist itself? Or is it a representation that resides in the people who view it? These questions are important for rhetorical studies because they introduce concerns about the meaningfulness of objects and the potential in those objects to enable and constrain our expression. Using vandalism of The Fist as my point of reference I argue for understanding expression as an embodied encounter with objects.